market is sitting on support , with a downward trend line above proving as a resistance - many talk of a rate hike, but maybe it's already "priced in" ??? 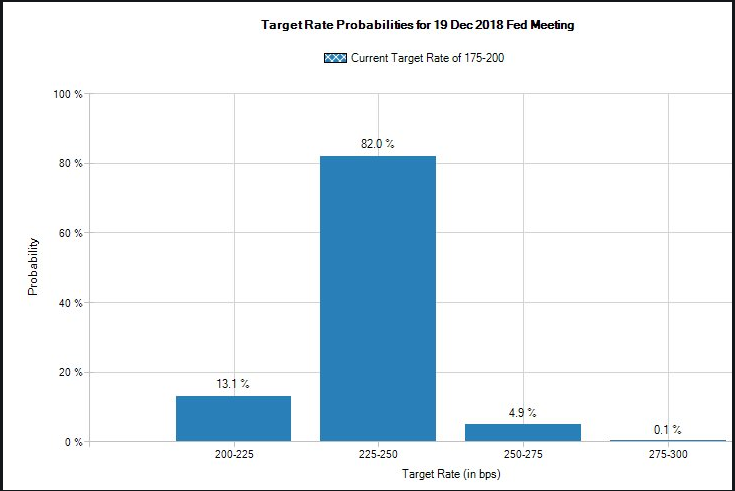 Yes the rate hike was priced in, interesting was the Fed signalling just how well the economy is doing and that 12 members now expect 4 hikes this year rather than the 8 from the June meet. The December rate hike is also being priced in. USD-DX basket approaching my previously mentioned resistance zone. 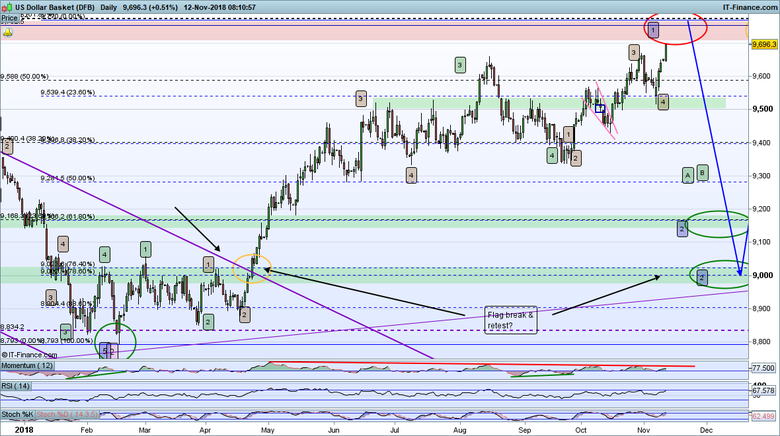 If an A-B-C is still to complete then this is a high probability test and rejection area. 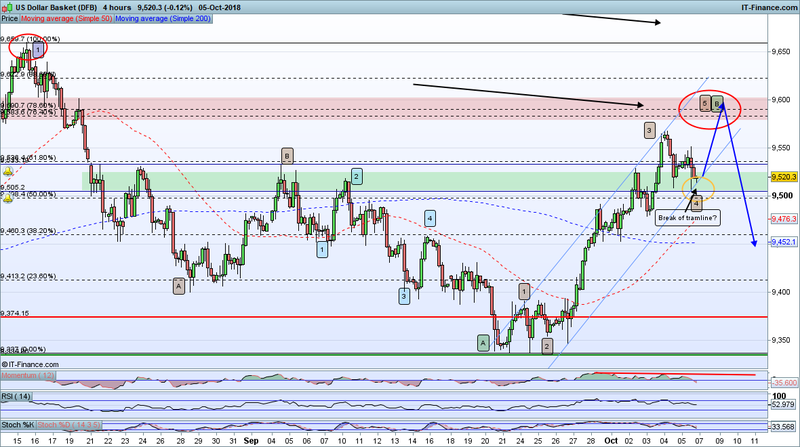 A significant break through suggests the USD rally is already on. Check EURUSD for finer detail analysis, this is just an indicator for me, I trade EURUSD as a proxy for USD. 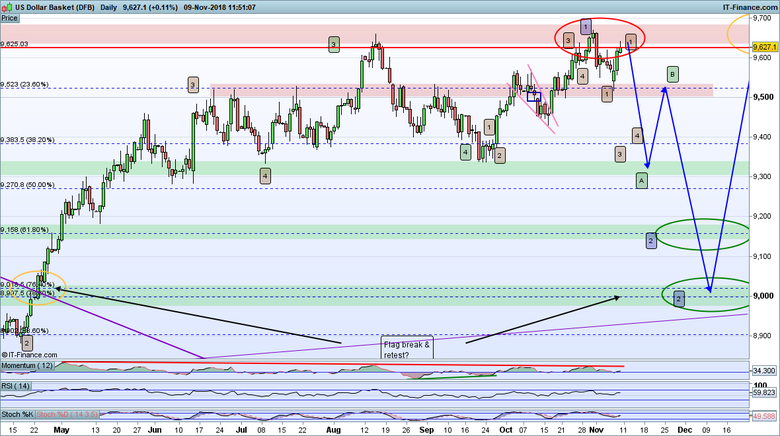 DXY is looking tough to call at the moment (but hey that may just be me). From as much as I can see from a technical perspective there doesn't seem to be a clear area of support or resistance / no channel / nothing on the Fibs at the moment . Sentiment seems to be split, and whilst US treasury yields are on a field day helping push USD higher ... there doesn't seem much else to give it real conviction. "I don't think we're supposed to rush out and revise our forecasts for tomorrow's data as a result, but the market will be braced for a strong outcome despite the potential drag from Hurricane Florence, and the underlying message is that the US economy isn't just in fine fettle, it's on fire. That has been enough to take 10year Note yields out of their recent range and to levels (2.23% and still rising) that we haven't seen since 2011. Ed Chairman Powell acknowledges that the funds rate is likely to get above ‘neutral' (i.e., above 3%) at some point, albeit slowly." 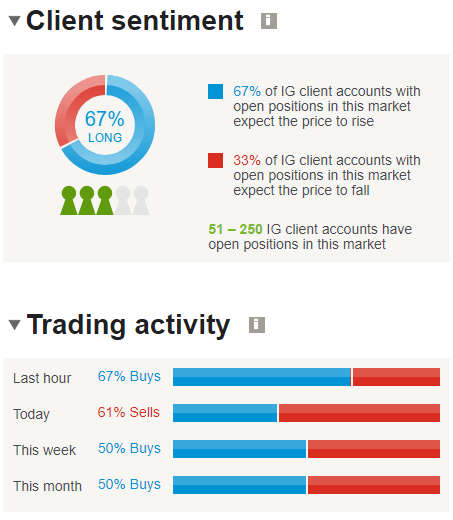 Not sure IG client sentiment is representative of the market in general, nor that DX as such is a good one to look at in this regard, EURUSD is much more heavily traded. Having said that DX price action is useful as an overall indicator of USD strength/weakness and therefore helpful to support views on USD pairs for me. Regarding Technicals on DX (and similar on EURUSD) I see the following short term (over and above previous longer term analysis already posted). 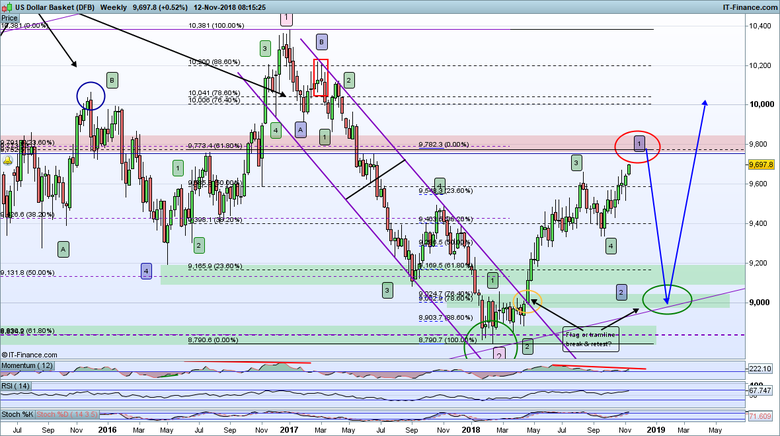 The 62% Fib and associated resistance zone has been broken leaving 76/78% as the last bastion for any Short trading (Long for the FX pairs). I remain of the bias that this is a relief rally in a Wave B (until past high is broken, which would indicate a strong rally phase). Wave Bs are devilish tricky to call and trade, they can go all the way to double tops/bottoms. I do have a tram-line pair and short term rally labeling that suggests another wave up to the Fib 76/78 area. If we see price action turns here and a break of tram-lines (inc on EUR/USD in particular) then a trade coul dbe on (Long EURUSD) and if sustained then it could be a decent bushel of points before the USD rally really gets going. US NFP could tell the tale here but as always volatility around this particular data release s difficult to handle. Top & turn looks like it came in yesterday in the end with a break of Tramline setting up shorts (on FX pairs at least). I would like to see a break of near term support to seal the deal. Anyone see it the same or differently? 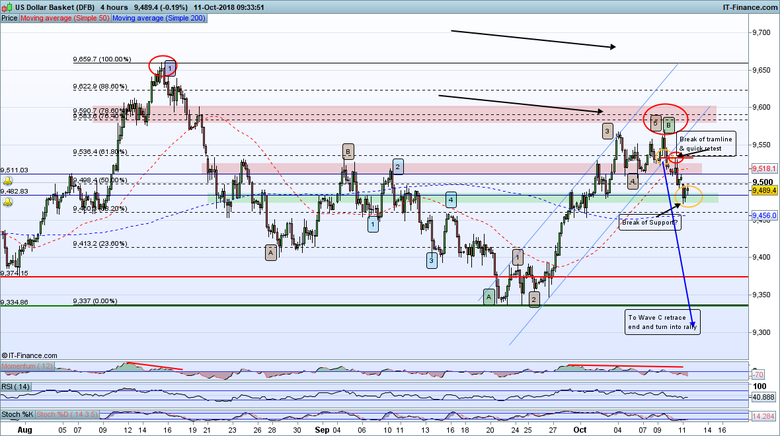 Just to provide additional perspective for my GBPUSD and EURUSD posts here is he DX 4 hourly chart that shows strong tramlines and indicated another leg up to the Fib 76/78% level before turning. A break of the tramline, whenever it occurs (if it does) supports the continuation of the GBP rally and the start of EUR rally. DX approach final turn point. 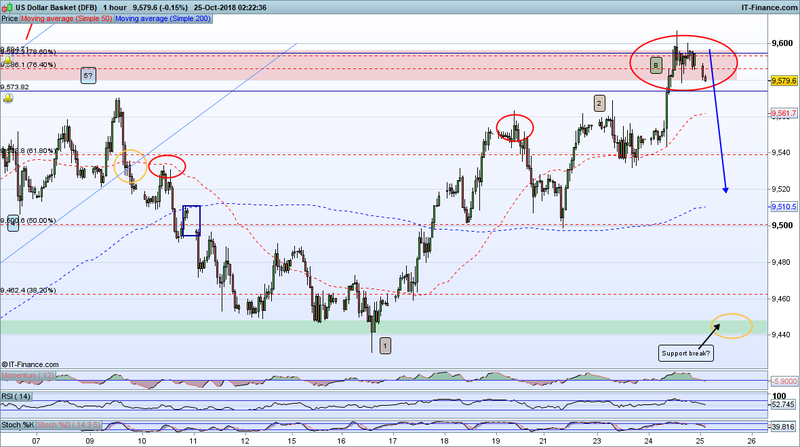 Hmm US indices rally and USD drop or reverse...? Nice retest of the tram-line break and bounce back down. 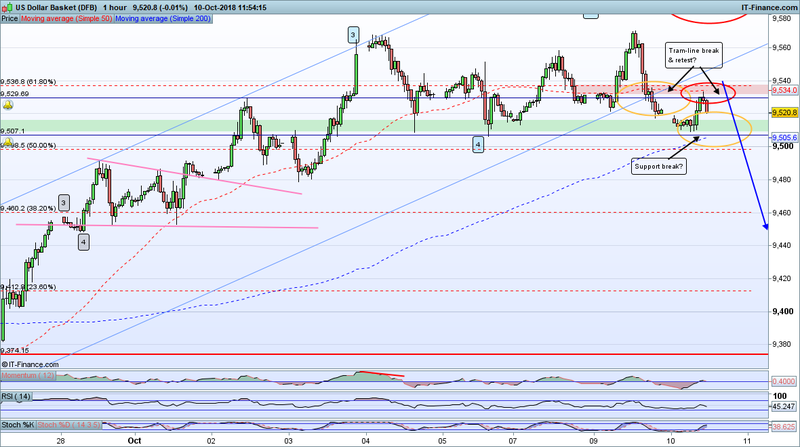 A follow up break of the lower support zone will confirm the turn for me. Mirror image on FX pairs with USD. 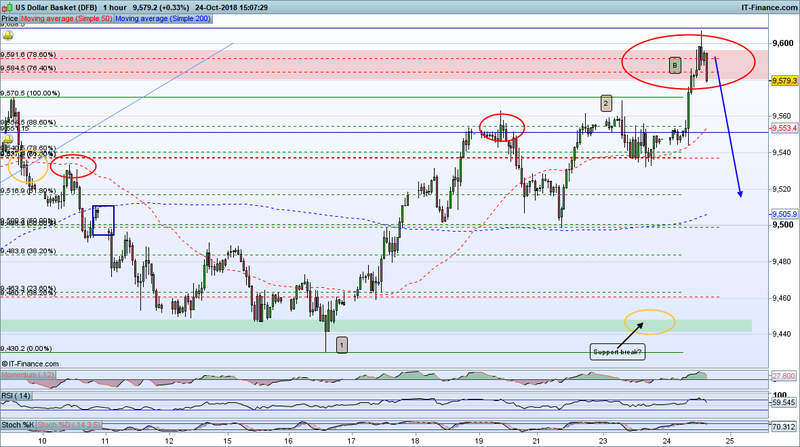 Could also support Indices rally from here. Looks like Gold/Silver may get a boost from falling USD too. 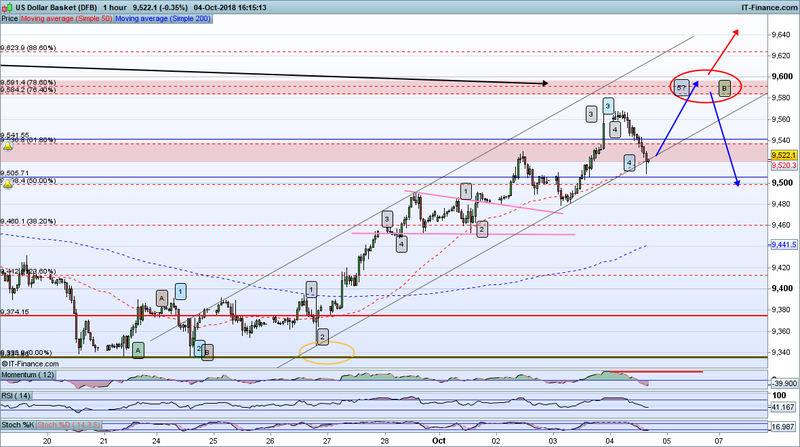 Just to complete the USD picture, again the market is currently following my route map nicely. We had a break through the 4 hour tram-line pair and a quick retest of that level with a rejection drop away. Now the market has been stopped (I think temporarily) at near term support. A break through this brings up a longer bearish phase to complete the turn scenario. I am expecting a drop past recent lows to make a fresh low for the overall bigger picture retrace in A-B-C form prior to the big USD rally resuming. My view is the opposite. 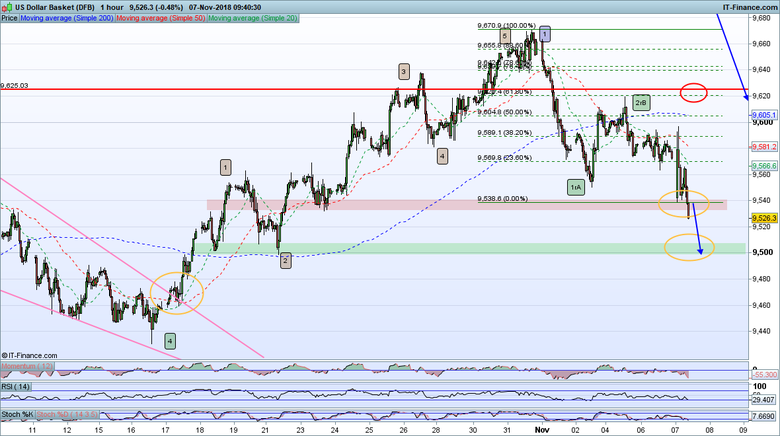 The price action remains consistent with my EURO and GBP rally in retrace scenario. AUD is leading the charge, a break above near term resistance will confirm a resumption of the retrace rally. Strong rally price action on Euro and GBP at important levels, albeit that another small leg down to on these 2 cannot yet be ruled out. Still showing Bearish signals (not strong but at important levels) despite heavy stocks losses, which may be a reason USD hasn't dropped harder yet. 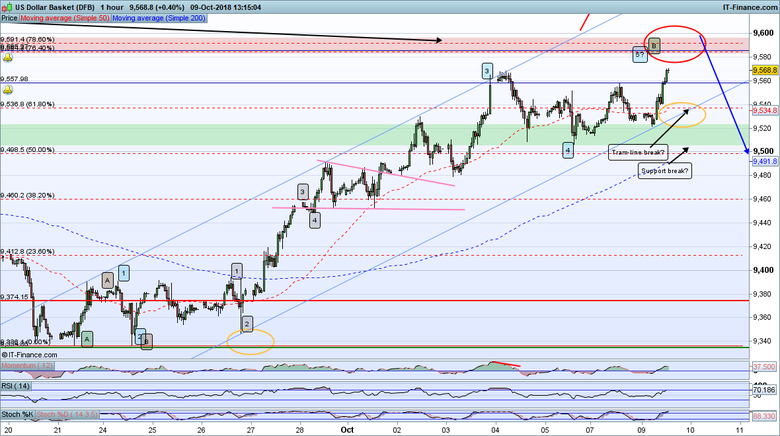 Perhaps a consolidation and/or turn on stocks could prompt a capitulation of USD? Might take a little while to resolve this one, maybe not until next week if we see the stocks bearish move calm down for a while. Friday's price action across the board will be interesting. Dollar Index breaks through support. Next port of call is the 9,500 zone. DX turning at the Fib 76/78% zone. If it drops consistently from here (even with a small final leg up to retest) the USD will be on a bigger picture bearish retrace in A-B-C form (road map is just illustrative as these A-B-Cs can proceed in many different shapes. Key point here is that a break down starting below the wave 1 (blue) is crucial to the retrace set up and a fresh break above raises the probability that a big USD rally is on. Recent moves would certainly appear to suggest the USD rally remains strong. Is the USD going up long term? I believe so. But is it now? I am less sure. I will not be confident until significant resistance is broken and ideally after a significant retrace bearish move, neither of which have occurred for me. Regarding Gaps, well you know my view that your gaps are not real gaps @elle but never mind that because it is moot if we both believe USD is going to rally through those gaps, at some point. There are however some Gaps on EURUSD (tail gaps) and GBPUSD, especially recently, that remain unfilled. 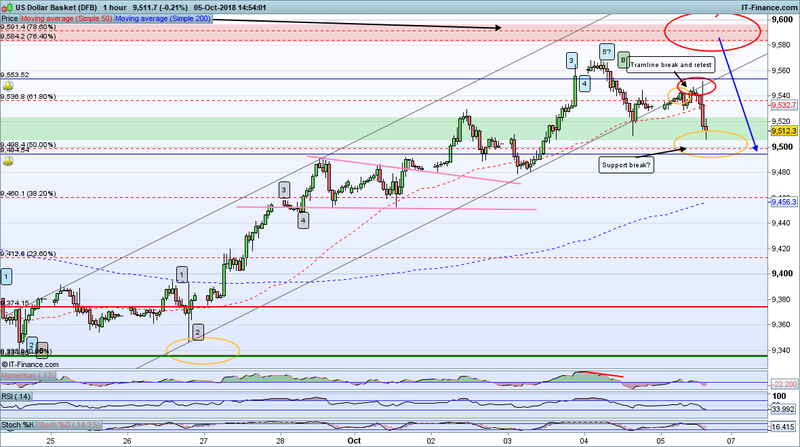 So despite my EURUSD rally set up not working this time I cannot eliminate that set up, starting from a lower level. 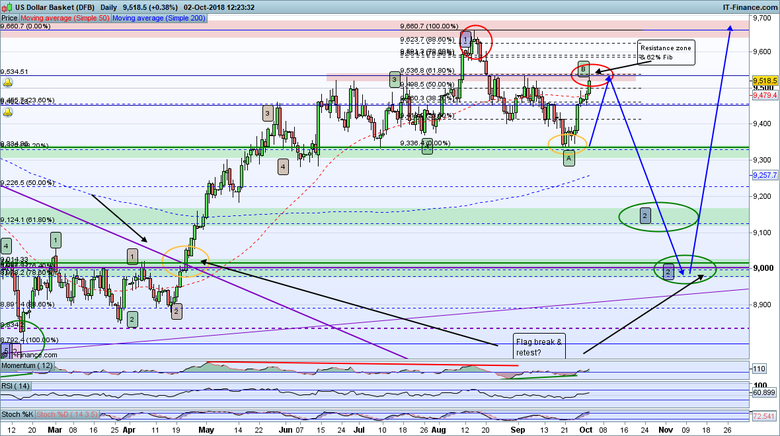 GBPUSD still looks set to be on a larger retrace move and AUD (not part of DX basket) also remains in a bullish set up. Therefore my lead scenario on DX remains Bearish in the short to medium term but Long term Bullish. 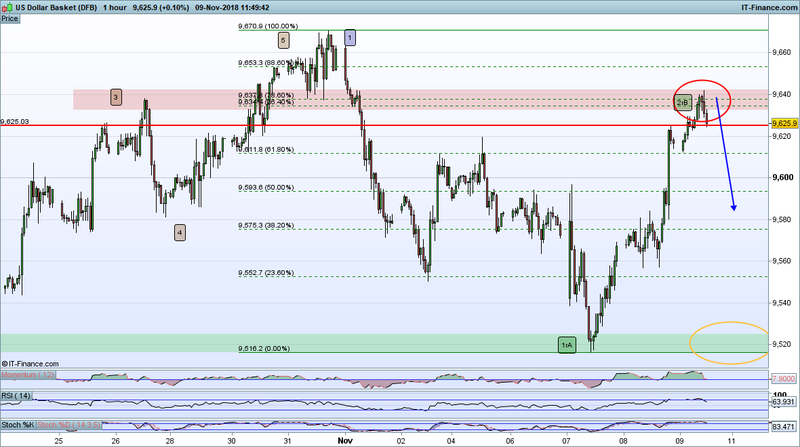 My approach will be to wait for price action around the over head resistance level (Fib 62%) and assess matters then.